Seriously, what is it that makes some people so hateful? I know this "secret" wasn't aimed solely at me, but still… What gives them the right to think they have the right to tell me what Sims I should or shouldn't be making? They are my characters. I can do whatever I damn well want with them. And really…"no offence [sic], but…". The only time that phrase is used is when someone knows they are being offensive. 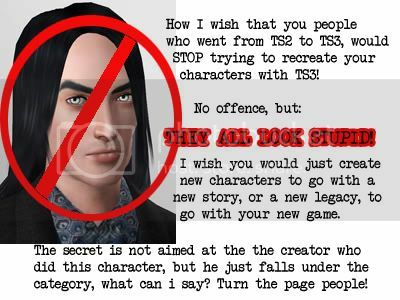 Also, "the secret is not aimed at the creator who did this character…". Ri-ight… They why was a picture of my character used to illustrate your point? Grrrr… I really, really hate people sometimes. This really pissed me off. Normally, I'd try to ignore something like this, but I guess it just came about at an emotionally fragile time. I think I'll just keep this site for Sims 2 stuff from now on and enjoy my Sims 3 characters on my own. NSFW Warning: Naked booty ahoy! Oh, wow! This took a lot longer to post than I had planned. September was a super busy month: my parents came to visit (super fun! ), I did some BJD (ball-joint doll) related stuff, and then the month was gone. Crazy! Anyway, here is the last group of pictures from my test neighborhood. These mostly focus on Julian and Viktor. Just to let you know, I'm starting to receive warnings from my ISP that I'm at 80% of my bandwidth limit. It may run out before the end of the month. I must figure out another place to host my images. I'm sure that's why I'm running out of bandwidth. I don't want to use photobucket as they compress my images too much. I'm not sure what to do. Blah. So, if the website goes down before then, that's the reason why. No need to panic! haha I'll see you next month! Have you been curious to see how Julian turned out? As some of you know, Julian is a rockstar and, like Viktor, he's also based on a doll of mine. Well, it's time for his Sims 3 debut. And, if you're wondering what I think Julian sounds like, you can check out Julien-K's newest album. It's Viktor's turn to step in front of the camera. Some of you may not know, but Viktor Quinn is based on a ball-joint doll that I have. In his past, Viktor was a circus performer (knife thrower) who was urged by the management to take some time off after a romance with one of his co-workers turned sour. In desperate need of a job, one of his aquaintances put him in touch with Julian Nomad's manager. Due to a recent scandal, Julian was in need of a bodyguard, and Viktor was a perfect a fit for the role.